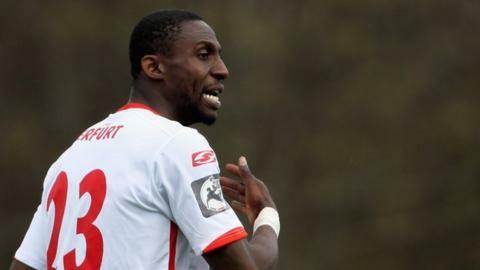 German police have confirmed that the family of Steve Gohouri has filed a missing person's report for the former Ivory Coast international. The 34-year-old attended his German club's Christmas party on Friday before heading to see his family in Paris. Six days on, the TSV Steinbach defender has yet to arrive. "We are taking the case seriously and are aware of the family's concerns," Dusseldorf police spokeperson Susanna Heusgen told BBC Sport. "A missing person's report has been filed." "So far, we have no leads but bear in mind that as an adult, he is entitled to do what he wants." After spells in France, Switzerland, Greece and England, the defender is winding down his career with four division German side TSV Steinbach. A post on the website of TSV Steinbach, located north of Frankfurt, confirms his disappearance. "TSV Steinbach was informed on Tuesday evening that its player Steve Gohouri is missing," it reads. "Further circumstances are unknown so we cannot give any comment at this stage." German media has quoted Gohouri's coach at Steinbach as saying the Ivorian may be struggling off the pitch. "There is speculation, and I hope that it's not true, that he had personal problems and has abandoned his responsibilities," Thomas Brdaric told local paper RevierSport. "He shouldn't do that to his family or his employer." Gohouri, who was an unused squad member at the 2010 World Cup, made his Ivory Coast debut in 2006.